Will they make it to the West? This weekend has brought the Dragon Quest Summer Festival, and with that there were a few announcements. One of these is pleasing for fans of the very beginning of the franchise, with news that this month will bring the first three games on the 3DS. 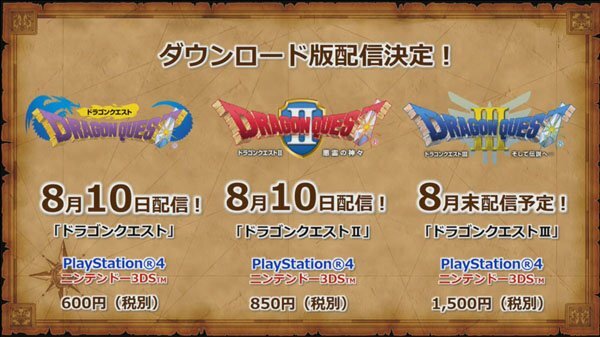 As you can see, the first two titles will land on the 3DS (and PS4) on 10th August, with Dragon Quest III to come later in the month. The question, of course, is whether we'll get equivalent releases in the West. These originally came to the NES as Dragon Warrior games, so whether these will make their way to the 3DS outside of Japan but with the Quest name will be interesting to see. Would you like to buy these for your 3DS? 1, 2, 3, GO ! Also, Lol at the price. Dragon Quest III is the most expensive of all. Yes! I love the original Dragon Warriors. But which are these, the original NES/Famicom releases or are they the redone ones found on other devices? I'd love to see them as 3D classics. But I'll take them in any form! If they come West which is probably unlikely I'd like them on Switch or even Wii U VC. @SLIGEACH_EIRE You're kidding? The Wii U? I can maybe see them coming to the Switch somewhere down the line. Well, that's one way to keep the 3DS alive (in Japan, leastways). @buildz Yeah screw those Wii U owners, amirite? @buildz Switch has about 5 million customers, Wii U has 13 million owners. Putting VC games on a console isn't as difficult. So are these ports, remakes, remastered, what are these cause I had multiple versions of them already? If they're just ports then I'll pass but if they are remakes like the DS and 3DS ones then consider me interested. If they are just ports then they seriously need to just put them on compilation, if they are remakes, bring them to Switch instead of the 3DS. It would be a waste of time if these are just ports and only Japan exclusives though. I mean how many times did Japan got these games, this is like maybe the fifth time now (Famicom, Super Famicom, Game Boy Color, Wii and now this). I would buy them! I never played these 3 and I've heard 3 is awesome. Please come to North America! I've played all except 1-3 and 10/11. I'd definitely buy them for my 3DS if they ever come to the west. With all the flak I've given to the latest victim of Square Enix's Nintendo Console Spinoff Syndrome, I have to admit the 3DS is becoming the go-to console to get collections, compilations and whatnot. Between Smash Bros. on 3DS, the Megaman Legacy Collection, Mario Maker, the Virtual Console, the metric f-bomb-ton of Zelda games and everything else, the 3DS is becoming a museum of all gaming, period. I really hope these are the ports of the iOS/Android versions! @SLIGEACH_EIRE The Wii has a 100 million userbase, they should release it for the Wii instead. @Octane Haha The Wii eShop is still up and running so why not. Man I will be so salty if they don't bring these to the west. The ability to have 1-9 on a portable console is amazing. We already have the others...just release these too! From what I understand the 7 and 8 remakes sold well. Been wanting these out here forever. I love the old games, III is in my top ten all time games. 1-9 on my 3DS would be sweet. I'd love them to get the remake treatment like 4, 5 and 6. Oh man, I'd love the original three games on 3DS. I'd totally buy them. I take it they're eShop only? @SLIGEACH_EIRE You are assuming that every WiiU sold is still in use and that folks are willing to keep spending money on it. That's certainly true for some, but equally certain not for all. Also, while there are more WiiU out there than Switch consoles, that will only hold true for so long. By the time any of these games might make it west, it's incredibly unlikely that the WiiU will still have any 'sales edge' left. I'm not saying that the Wii U is entirely pointless, but as far as lifetime sales go, the Switch might make a helluva lot more sense than the Wii U - certainly for anything that will not release before 2018 anyways. We get so bored expecting such big and historical releases that when we give up thinking about, it just happens! So...What took it so long? The answer may be the "it is time"! Actually, IMO, the videogame companies are more clever in profiting their biggest franchises nowadays, so when there is a new release, we may see the classics games coming back - as a marketing, as finally satisfying the fans and promoting their franchises in all its past and present glory. Anyway, I am really happy to see such surprises on 3DS! Hope we may see these on the west side. But I'm not being generally optimistic about it, since DQ not always comes to these parts of the world. When Dragon Quest XI comes out for the Switch, there would be nothing stopping these coming to the Switch also right? I doubt a western release will happen. We still don't have the 3DS version of Final Fantasy 1. Come on Square, this would be perfect to go with that Secret of Mana Collection. You know we want these, just bring em out Digital Only if you're worried they won't sell! "so whether these will make their way to the 3DS outside of Japan but with the Quest name" is technically precedented by DQIV on DS, I suppose, so why not? I'd buy them on 3ds for sure. Are these going to be VC or something else? This is more important than it looks. IV, V and VI got DS ports so they are playable on 3DS while VII and VIII have been released on 3DS. I really hope that this trio comes to Europe! Some good games. One can hope. If these make it to the 3DS outside of Japan, I'll definitely consider picking them up. It would appear that these are ports of the mobile versions. Which is not a bad thing. @SLIGEACH_EIRE The Wii U has more users, but, realistically, how many of them would actually care for the ports? You have to consider the demand from users; and, I'm afraid to say it, people don't give a crap about the Wii U anymore. Yes Please! I want DQ 1-3 in my New 2DS XL ASAP! @ecco6t9 weren't the mini medals taken out of the mobile ports? That is a bad thing. Plus dragon quest 3 was really the only one that aged well, and even then it doesn't hold a candle to final fantasy 5 (as my icon dances around it) in terms of stories/jobs. Though the ancient cave hack to make blue mage playable in chests from random dungeons pretty much fixes any problems with the job though Hermes shoes ninja is badass, and even the geomancer is helpful for the random floors with damage tiles. But still no NA release for the Mana Collection??? @AlphaJaguar the first one def. is. 1500 Yen for a Famicom virtual console release is all kinds of crazy. I'd be so happy if they'd release the 25th Anniversary Collection for the 3DS. That was the one that was released on the Wii and contained both the Famicom and Super Famicom versions of DQ1-3. Very cool... That's the one series i want to return to. Looking at the logos for the different games, I'd say they are from the SNES remakes. It would be nice if these were got an official release in the west since they're one of my favorite because of the controls and sound. It really is a shame the SNES never got these ported over to the west. Haven't played the second one. The third fixed some of the horrendous leveling and grinding issues of the first, though I noticed that the more people you had in your party, the less exp everyone got instead of doling things out equally. I don't care who I offend, the first dragon warrior is awful. Based on the sales of 7 and 8, hell no. Are they ports of the iOS versions? Those were relatively good editions, but I'd love to see full 3D remakes of the originals, with all of the SFC and GBC content (all versions of DQIII: Seeds of Salvation since SFC have cut out the super cool cutscene at the start, for example; while also missing a whole dungeon that was included in the GBC port). @marandahir I would assume so. The prices are too varying to just be virtual console releases, but they actually match up with the mobile ports. If so, then we could hope for a western release as the translations are already done! I have 1-3 on my Android phone, but I'd gladly pay for 3DS versions just to play with a d-pad and buttons. Please come to both e-shops 3DS and Switch. Really square!? 3ds and... Ps4! Switch for crying out loud, switch! @NicolausCamp good point, not as if they have to translate these again. I have all these on my iPhone. I would buy them again on the switch VC but I sold my 3ds off for lack of use(not lack of a fantastic library, it has that for sure). I do love the franchise though, so the more the merrier. It has a great sense of humor, doesn't take itself as seriously as Final Fantasy. @bolt05 Wouldn't surprise me if they release them on Switch when that version of DQ11 is released. And speaking of posting pictures. 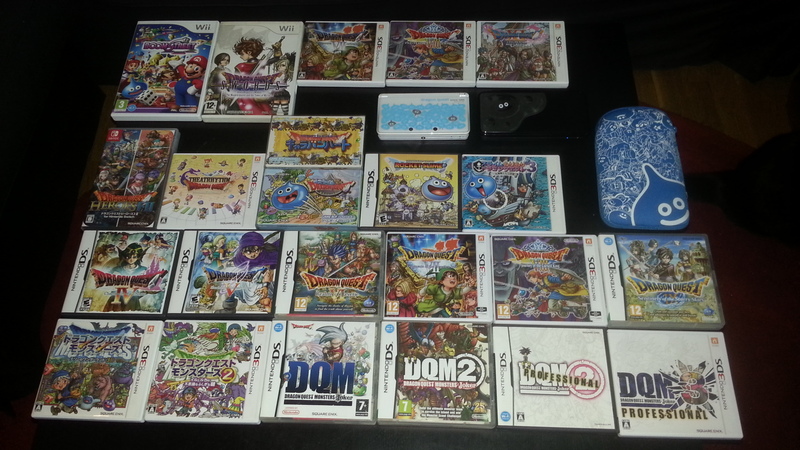 Here's my DQ collection! I'm currently playing 11 on my Metal Slime New 2DS XL and I'm really, really loving it. About 14 hours in so far and it's allaround a fantastic game! Probably depends on how VII and VIII sold in the west, and whether they are straight up ports or require any new localisation. @NicolausCamp Superb collection! You have a couple I don't have. Great series for sure. I don't have a Switch, either, but with such an awesome 3DS library, the new-handheld-induced hurry isn't a problem this time around. This is awesome! They ARE based on the mobile ports! Screnshots are on the official page! @NicolausCamp If the price is the same as the mobile versions then it's a fair deal and I'll get the three of them. Those versions are based on the SNES remakes of the original NES games. It's nice that they are using the second screen for the map. I thing I would pick these up. I loved those as a kid. I can see from the JP eShop they are ports of the mobile versions. 1 is simplistic, although it was good in its day. 2 has too many difficulty/leveling spikes. 3 is good, but the GBC version is easy to solo. I have a solo walkthrough on Dragon's Den from about 10 years ago.